On August 3rd, 1943, less than two weeks after the Kursk offensive, the Soviets launched a massive offensive near Kharkov that ripped open the German line. The ensuing battle began their summer offensive that would take them across the Ukraine to the Dnieper River. During August the two sides were equally matched and a tremendous war of attrition raged from Kharkov to the Sea of Azov with neither side willing to give ground. In September, bled white by the never-ending Soviet attacks, the German army retreated in haste to the safety of the Dnieper River. In October, the battle raged along the length of the Dnieper and for the Perekop Peninsula, the only land exit to the German 17th Army in the Crimea. During this three month period German reinforcements poured in from every sector, but it was never enough. Three Soviet Tank Armies and four Soviet Fronts ground through nineteen panzer and panzergrenadier divisions. German and Soviet losses were staggering. Kiev, the capital of the Ukraine, fell on November 6th. Ukraine '43 attempts to simulate this important campaign in a moderately complex game. The design uses the conventional move-fight-exploit sequence of play and the popular Zone of Control Bond rules. Soviet tank armies and German panzer corps spearhead constant attacks and counterattacks. With both sides able to attack, the game becomes a tense battle of skill and nerves. 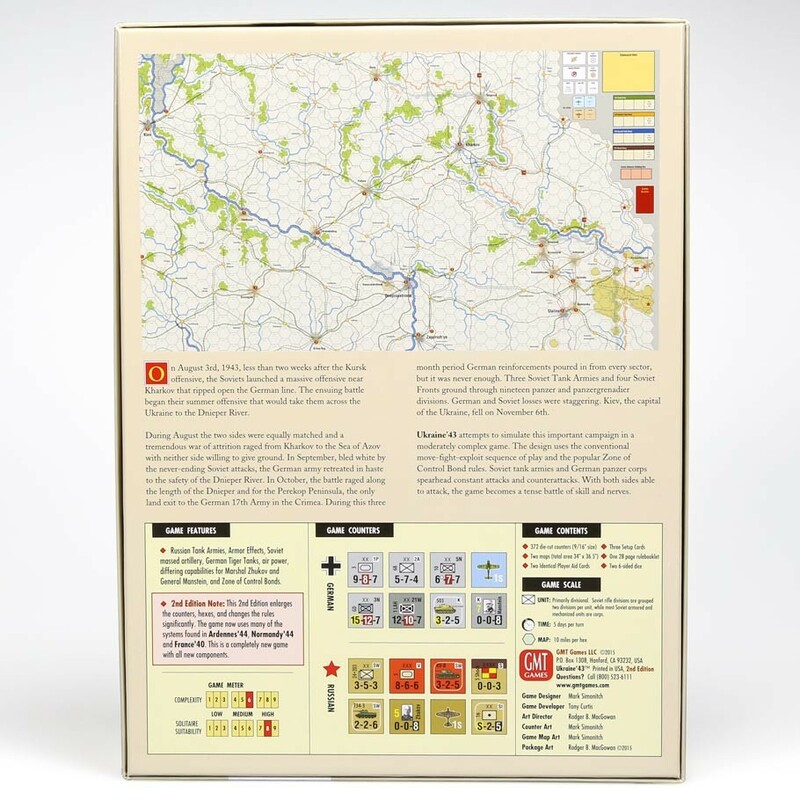 The 2nd Edition has been re-designed to play much faster using the system used in France '40 and Normandy '44. 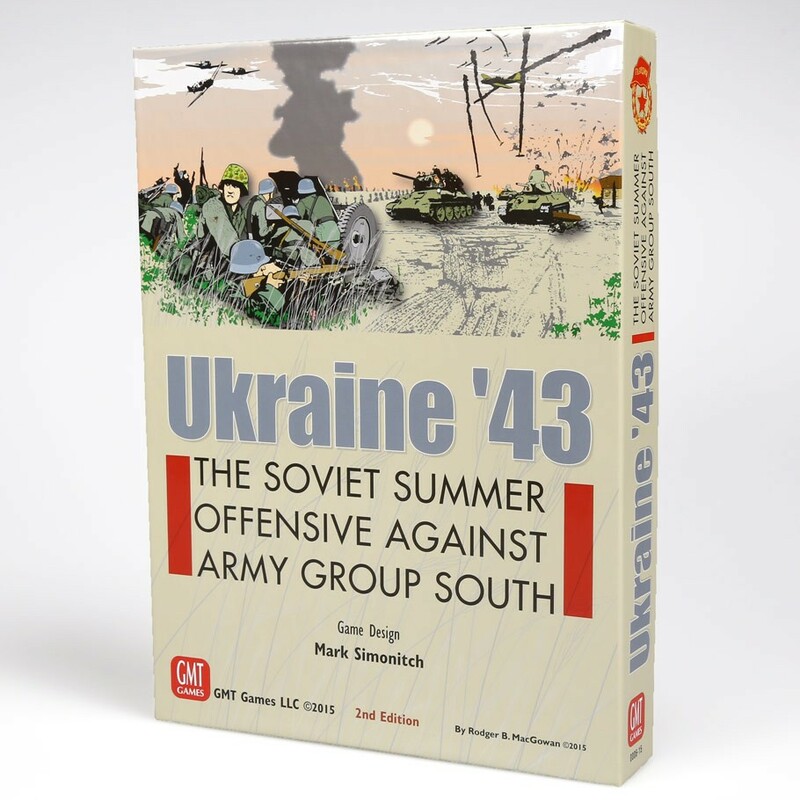 Players familiar with those games will find the new Ukraine '43 very easy to learn. All the components will be upgraded -- the counters will go from half-inch to 9/16 size, the map will be enlarged so the hexes can accommodate the larger counters, and each scenario will now come with a setup card to facilitate setting up the game.